Systemic vascular pressure in vertebrates is regulated by a range of factors: one key element of control is peripheral resistance in tissue capillary beds. Many aspects of the relationship between central control of vascular flow and peripheral resistance are unclear. An important example of this is the relationship between hypoxic response in individual tissues, and the effect that response has on systemic cardiovascular adaptation to oxygen deprivation. We show here how hypoxic response via the HIF transcription factors in one large vascular bed, that underlying the skin, influences cardiovascular response to hypoxia in mice. We show that the response of the skin to hypoxia feeds back on a wide range of cardiovascular parameters, including heart rate, arterial pressures, and body temperature. These data represent the first demonstration of a dynamic role for oxygen sensing in a peripheral tissue directly modifying cardiovascular response to the challenge of hypoxia. Diseases of the heart and blood vessels are linked with high blood pressure. The causes of most cases of high blood pressure are unknown, but it is often accompanied by the reduced flow of blood through small vessels in the skin and other parts of the body that are a long way from the heart. It is not clear why this change happens or why it tends to get worse over time in people with high blood pressure that has not been treated. Previous research has shown that when a tissue is starved of oxygen, blood flow to that tissue will increase. The HIF family of proteins help to increase blood flow to tissues in these low-oxygen situations. To investigate what role the skin plays in the flow of blood through small vessels, Cowburn et al. exposed mutant mice that cannot produce certain HIF proteins specifically in the skin to low-oxygen conditions. The experiments show that mice lacking either HIF-1α or HIF-2α in the skin have altered responses to oxygen starvation that affected their heart rate, blood pressure, skin temperature and general levels of activity. Mice lacking specific proteins controlled by the HIFs also responded in a similar way. Cowburn et al. also demonstrated that the way normal healthy mice respond to oxygen starvation is more complex than previously thought. Blood pressure and heart rate rise in during the first ten minutes. This is followed by a period of up to 36 hours where blood pressure and heart rate decrease below normal levels. By around 48 hours after exposure to low levels of oxygen, blood pressure and heart rate recover, returning to normal levels. Loss of the HIF proteins or other proteins involved in the response to oxygen starvation specifically in the skin affect when this process starts and how long it takes. These findings suggest that the responses of the skin to environmental challenges may have substantial effects on the how the heart pumps blood around the body. More studies are needed to understand how the HIFs and other proteins may contribute to high blood pressure and diseases affecting the heart and blood vessels. Vertebrates confront the world chiefly through the skin. As a reflection of how different vertebrates adapt to the environment, skin structure varies to a significant degree from one vertebrate class to another, and even within classes. One of the key differences in skin function found amongst vertebrates is the degree to which it responds to environmental variations; in particular, the extent to which these changes in turn affect systemic organismal physiology. Mammalian skin is amongst the most complex of all the vertebrate forms of skin. It also varies significantly in its form in the different orders of mammalia, with variations chiefly following adaptations to the external environment. A key physiological challenge faced by most multicellular organisms is variation in oxygen supply. This is a common challenge to animals that obtain their oxygen from surrounding water, particularly those that live in fresh water; it can apply also to mammals at high altitudes, or during movement into a small den or confined space. Hypoxia also occurs in various tissues if there are high levels of oxygen demand, e.g., in skeletal muscle during exercise. Work undertaken over the last 50 years has shown that acute systemic hypoxia in mice, rats, rabbits, chickens, dogs, sheep and humans causes acute tachycardia and hypertension (Korner and Edwards, 1960; Butler, 1967; Yasuma and Hayano, 2000; Campen et al., 2004; Campen et al., 2005; Walsh and Marshall, 2006; Heinonen et al., 2016; Giussani et al., 1993; Fletcher, 2000). Prolonged hypobaric hypoxia in humans has also been shown to cause tachycardia and hypertension (these studies have primarily been undertaken in high altitude environments or models thereof)(Schultz et al., 2014; Calbet, 2003; Naeije, 2010; Hainsworth et al., 2007; Vogel and Harris, 1967). The skin has an extensive vasculature, which is known to be responsive to shifts in oxygen availability (Durand et al., 1969; Weil et al., 1969; Kuwahira et al., 1993; Minson, 2003). Keratinocytes in low oxygen release nitric oxide to increase blood flow and thereby improve perfusion (Cowburn et al., 2013; Pucci et al., 2012). Of interest, it has been shown that in both rodents and humans the basal epidermis is hypoxic relative to the underlying dermal tissue, and displays constitutive stabilisation of hypoxia inducible transcription factor-(HIF)α proteins (Cowburn et al., 2013; Cowburn et al., 2014; Peyssonnaux et al., 2008; Boutin et al., 2008). HIF transcription factors initiate the transcription of multiple genes involved in oxygen homeostasis, including a number that regulate vascularisation and metabolism (Semenza, 2003; Semenza, 2009; Pouysségur et al., 2006; Formenti et al., 2010; Djagaeva and Doronkin, 2010; Hubbi et al., 2014). We have previously shown that a dichotomous regulation of nitric oxide is conferred by HIF-1α and HIF-2α regulation of the NOS2 and arginase genes (Semenza, 2003; Jung et al., 2000) and have now documented this in a number of tissues and cell types (Cowburn et al., 2013; Takeda et al., 2010; Branco-Price et al., 2012; Cowburn et al., 2016). The HIF-1α/NOS2 and HIF-2α/arginase pathways strongly influence tissue L-arginine consumption and NO generation (Cowburn et al., 2013; Takeda et al., 2010; Branco-Price et al., 2012). We have also shown that keratinocyte selective deletion of HIF-1α reduces epidermal NO levels, whereas loss of HIF-2α suppresses arginase expression/activity, increasing local concentrations of NO (Cowburn et al., 2013). Hence, in murine skin, cutaneous NO levels are determined by differential HIFα isoform expression which affect both local vascular resistance and systemic blood pressure. Little is known, however, concerning how a localized tissue response to hypoxia affects the cardiovascular system more generally. The literature on the response of animals to systemic hypoxia and its cardiovascular effects is limited almost exclusively to studies under anaesthesia. Hence, almost all previous studies have focused on the first ten minutes of the hypoxic response. Radio-telemetry in non-anesthetised non-restrained animals allows a more rigorous evaluation of the changes in hemodynamic variables during the acclimation to environmental hypoxia (Kawaguchi et al., 2005). The work described here demonstrates for the first time that systemic hypoxia induces a tri-modal response: with an initial tachycardia and hypertensive phase that lasts approximately 10 min, followed by an immediate and profound drop in heart rate and blood pressure that can last as long as 24 hr, followed by a recovery to close to a normoxic state. In this context, we show that peripheral resistance and oxygen sensing, in this case in the skin, plays an essential role in this systemic cardiovascular response. These data demonstrate that peripheral tissues can play a fundamental role in cardiovascular adaptation to hypoxia. In this study we utilise mouse strains with conditional alleles of Hif1a (Ryan et al., 2000), Epas1(HIF-2α)(Gruber et al., 2007), the HIF-1α target gene, nitric oxide synthase-2 (Nos2) and the HIF-2α target gene, arginase-1(Arg1)(El Kasmi et al., 2008), crossed to mouse strains expressing Cre recombinase under the control of the keratin 14 (Krt14) promoter (Vasioukhin et al., 1999). All mice are extensively backcrossed (more than 10 generations after selection by strain-specific SNP analysis) into the C57/Bl6J strain background. This promoter drives the excision of the gene of interest where the K14 promoter is active, that is, within basal layers of the epidermis and in restricted numbers of cells in a small number of other epithelial tissues, chiefly the oesophagus and salivary and mammary glands (Vasioukhin et al., 1999). 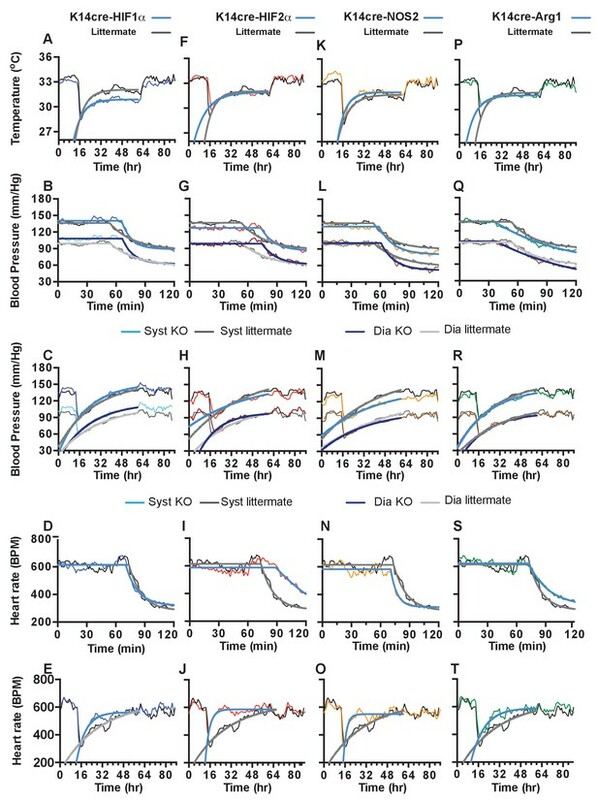 Continuous monitoring of unrestrained, non-anesthetised mice via radio-telemetric catheterization showed that although resting heart rates were unchanged in all mutants relative to wild type controls (n = 7) through diurnal variation (Figure 1A), there was a constitutive hypotensive state in K14cre-HIF-2α mice (n = 7) and NOS2 mutants (n = 6) (Figure 1B) and a strong trend towards a hypertensive state in K14cre-HIF-1α mice. Cutaneous temperatures were also monitored by radiotelemetry (Figure 1C). Here, we saw that cutaneous temperatures in K14cre-Arg-1 mutants was significantly higher than littermate controls and trend lower in HIF-1α mutants. These data confirm our previous observations using tail-cuff occlusion and infra-red analysis of skin temperature (Cowburn et al., 2013). Analysis of physical activity showed no significant difference in the movement levels between the mutant groups and littermate control mice, suggesting these differences in temperature do not result from variable activity (Figure 1D). The effects of hypoxia in mammals have been studied in humans and a range of animals(Korner and Edwards, 1960; Butler, 1967; Yasuma and Hayano, 2000; Heinonen et al., 2016; Kawaguchi et al., 2005). Curiously, published measurements to date indicate that almost all studies examining the cardiovascular effects of hypoxia have been carried out either over long time frames, that is, weeks and months, as part of studies of high altitude adaptations, or over very short time frames of approximately 5 to 10 min, typically under anaesthesia. To better understand how hypoxia at varying levels affects the cardiovascular parameters of blood pressure, heart rate, and cutaneous temperature in mice over time, we subjected wild-type (C57/Bl6) mice with implanted radiotelemetric reporters to 15%, 12%, and 10% normobaric oxygen over 48 hr, followed by 24 hr of recovery at 21% normobaric oxygen. The transition to low oxygen levels occurred in each case at the dark-light interphase (dark cycle equates to the shaded regions in the graphs). As noted above, the acute cardiovascular response to hypoxia has been described in a number of animal models. As previous investigators have documented, there was an acute response in the first 10–15 min, with increased ventilation (160BrPM to 250BrPM), and a hypoxic pressor reflex, with blood pressures increasing from means of 123/88 mmHg (baseline) to 143/102 mmHg within the first 10 min (Figure 2A–B). Following this brief initial response, there was a severe drop in systemic blood pressures at the 12% and 10% oxygen levels, to means of 87 mmHg SBP and 57 mmHg DBP at 120 min for 10% oxygen (Figure 2C–D). Heart rates peak at 13 min in the lowest level of hypoxia, from 606 BPM (baseline) to 717 BPM at the lowest levels of oxygen, followed immediately by a decline to 285 BPM (a 53% drop from baseline) at 120 min post-transition (Figure 2E–F). Analysis of subcutaneous temperature has previously been used as an indirect measurement of peripheral vascular resistance(Schey et al., 2009). We found that skin temperature rapidly decreased from 33.7°C (baseline) to 28.9°C (−4.8°C) 180mins post hypoxic challenge (Figure 2G), suggesting an increase in peripheral vascular resistance. Physical activity also declined from 5.3 m/hr to 0.2 m/hr in the 120 min following the introduction of 10% oxygen. This change, similar to those seen in blood pressure and heart rate, demonstrates that lowered levels of oxygen cause a triphasic cardiovascular response, with the degree and duration of this response dependent on the level of oxygen. At the lowest FiO2 studied, 10% oxygen, there was an initial phase of response lasting 10–20 min that includes increased blood pressures and heart rates; then a longer depression, resulting in profound hypotension and bradycardia; followed finally by a chronic acclimation phase, with gradually recovering blood pressures, heart rates, temperatures and activity levels. We defined recovery as the point at which the animal reached 90% of heart rates and blood pressures seen at the same time of the diurnal cycle in normoxia; with this definition, recovery occured in 36 hr at 10% oxygen levels in wild type controls. In wild type mice this tri-phasic response is readily apparent at the two lower concentrations of oxygen (Figure 2). 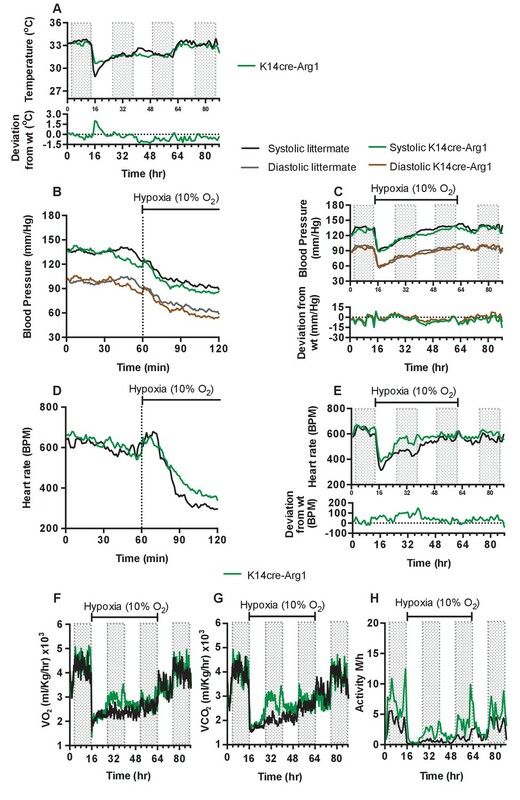 We chose to use a 10% oxygen challenge for the remainder of our experiments, as this level of hypoxia had the most pronounced (and thus easily dissected) phases of response, and yet still showed a return to normoxic cardiovascular parameters over time. As shown above, mice lacking HIF-1α, HIF-2α, NOS2 and Arg-1 expression in the epidermis show significant changes in systemic blood pressures and cutaneous temperatures relative to littermate control animals. All of these genes are involved in cellular adaptations to hypoxia. However, it is unclear how this cellular adaptation leads to more general tissue-specific adaptations to hypoxia. Even less well understood is how a peripheral tissue response might affect systemic responses to hypoxia. To undertake an analysis of that question, using the skin as a model for a peripheral tissue with a substantial vascular bed, we analysed the effect of loss of these hypoxia-responsive genes on the cardiovascular hypoxic response. We began with an analysis of the role of HIF-1α. As described above and shown in Figure 1, there is a decrease in skin temperature in mice lacking HIF-1α in keratinocytes. In these mice, the onset of 10% environmental hypoxia causes a sharper drop in skin temperatures (Figure 3A) than that seen in littermate control animals, and temperatures of the skin in HIF-1α mutants remain well below those of littermate mice in the second phase of hypoxic response; they do not recover until the restoration of normoxia (for statistical analysis see Figure 9A). Infra-red analysis of skin temperature was also used to monitor peripheral vascular perfusion during hypoxic challenge. The initial drop in skin temperature was comparable between K14cre-HIF-1α mutant and littermate control mice, as shown in Figure 3B. As described above, the HIF-1α mutants are essentially hypertensive under normoxic conditions, and this hypertension is exaggerated in the first phase of hypoxic response (Figure 3C, for statistical analysis see Figure 9B). However, in the second phase there is a larger drop in systolic and diastolic pressures relative to littermate control mice (Figure 3D, for statistical analysis see Figure 9C). This resolves rapidly, and although the subsequent systolic pressures in mutants are similar to those in littermate control animals, the diastolic pressures in the mutants begin to elevate. This elevated diastolic pressure begins in the first hour of hypoxia, and gradually increases throughout the 48 hr of hypoxic exposure (Figure 3D). An elevation in systolic pressures in HIF-1α mutants does not reappear until the animals are restored to normoxia. Elevation of diastolic pressures is indicative of an increase in peripheral resistance, and this is consistent with the lowered skin temperatures described above (Figure 3A). In Figure 3E and F, the acute and chronic changes in heart rate in littermate control and mutant animals can be seen (for statistical analysis see Figure 9D and E). The chief difference seen in the HIF-1α mutants is an increase in heart rate that is likely required to sustain systolic pressures; this coincides with the relative increase in diastolic pressures in HIF-1α mutants. Unlike the increased diastolic pressure, this tachycardia resolves following approximately 36 hr of hypoxia, indicating cardiac acclimation has occurred at that point. The chronic change in heart rate in HIF-1α mutants appears to coincide with an increase in whole-body metabolic activity between 12–36 hr hypoxia, as determined by VO2 and VCO2 analysis (Figure 3G and H). Normal metabolic activity is only restored when the animals are returned to normoxia. Physical activity is reduced in littermate control and mutant animals during the initial 12 hr of hypoxia. Activity slowly increases during the acclimation period, but does not fully recover until the animals are restored to normoxia (Figure 3H). Overall, loss of HIF-1α in the epidermis appears to delay the cardiovascular changes that occur in response to hypoxia; this is correlated with an increase in peripheral resistance and in heart rates. 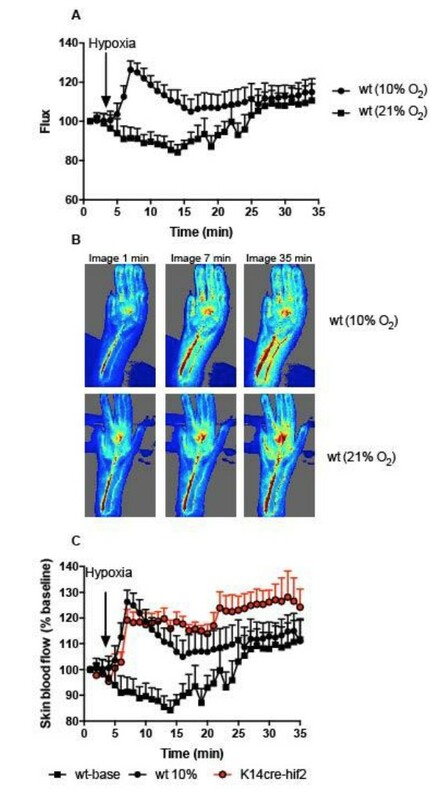 We have proposed a model for hypoxic responses involving HIF isoform activity and nitric oxide homeostasis in the skin that argues that hypoxia results in an initial HIF-1α/NOS2/NO mediated increase in vascular diameter, and resulting increases in perfusion; followed by a HIF-2α/Arginase-induced reduction of intracellular L-arginine (Cowburn et al., 2013). As L-arginine is necessary for NO production, this would suppress NO production by NO synthases, and ultimately cause vasoconstriction. This model for HIFα isoform action in hypoxic vascular tissues fits the observations described above for the loss of HIF-1α in the skin. In animals lacking HIF-2α in the epidermis, adaptation of skin temperatures in the first 12 hr of hypoxia follows the predictions of this model (Figure 4A), that is, we see elevated skin temperatures in the HIF-2α mutants relative to littermate control animals. These data are supported by infra-red analysis of skin temperature during short term hypoxia exposure (Figure 4B). The recorded drop in skin temperature is significantly less in the HIF-2α mutants relative to littermate control animals. Representative photomicrographs show the rapid drop in skin temperature during hypoxia exposure. However, after 24 hr, skin temperatures in mutants drop relative to littermate control animals, and remain lower than those of littermate control animals for 12 hr, before rising again to levels similar to those of littermate controls. Upon restoration of environmental normoxia, skin temperatures in mutants return to levels slightly higher than those seen in littermate control animals, that is, similar to those seen at steady state (for statistical analysis see Figure 9F). As shown in Figure 1, mean blood pressures of HIF-2α mutants are significantly lower than those of littermate control animals. For the first 24 hr of hypoxia, HIF-2α mutants show elevated systolic and diastolic pressures that are evident in the first minutes of hypoxic exposure (Figure 4C, [for statistical analysis see Figure 9G] and Figure 4D, [for statistical analysis see Figure 9H]). Here again, there is a shift at 24 hr, and although diastolic pressures at that point are similar to those seen in littermate control animals, systolic pressure drops relative to littermate controls. The systolic blood pressures remain substantially lower until normoxia is restored, when they return to steady state and mildly hypotensive levels. Finally, at the return of normoxia, diastolic pressures rise to levels substantially higher than those seen in littermate control animals for approximately 12 hr, before finally dropping again 24 hr after the restoration of normoxia. This effect on both systolic and diastolic pressures indicates that changes in the skin affect both traditionally understood changes in peripheral resistance, that is, changes that result in altered diastolic pressures, and other changes that can influence systolic pressures. The effect of hypoxia on the heart rate of the epidermal HIF-2α knockout animals is strikingly altered when compared to the effect on littermate control animals. Hypoxia has virtually no effect on heart rate in the HIF-2α mutant animals (Figure 4E, for statistical analysis see Figure 9I); they show a diurnal variation of heart rate that is essentially the same as that seen in animals in normoxic conditions (Figure 4F, for statistical analysis see Figure 9J). This is in comparison to the approximate 50% decline in heart rates seen in littermate control animals after two hours at 10% oxygen. Whole-body metabolic activity (VO2 and VCO2) in HIF-2α mutant animals is also significantly increased above littermate control rates between 12–24 hr hypoxia (Figure 4G and H). This increased metabolic activity does not return to levels seen in littermate control animals until the mice are returned to normoxia. Physical activity, similarly to the patterns described above, is greatly reduced in littermate and mutant animals during the initial 12 hr of hypoxia. However, activity of HIF-2α mutant animals recovers substantially between 12–48 hr, although it does not fully recover until the animals are restored to normoxia (Figure 4I). These results indicate a complex response of the skin to systemic hypoxia, and also demonstrate that that complexity is mirrored in the effect of those responses on the cardiovascular system. The crossover seen in skin temperature and blood pressure at 24 hr also indicates that there is likely a phase of adaptation at that time point revealed by the HIF-2α deletion, and related to a temporally specific action of HIF-2α in the adaptation and response to hypoxia. Given the complex role of HIF-2α in the epidermis, and our hypothesis that this could be determined by the differential effect of HIF-1α and HIF-2α on NO homeostasis, we next analysed the overall levels of NO metabolites induced by hypoxia in specific tissues following hypoxic exposure (Figure 5). As can be seen in Figure 5A, there was a steep drop in plasma NO metabolites over the first day of hypoxia, followed by a more gradual decline over the following 3 days of exposure (Figure 5A). However, as shown in Figure 5B, in skin, and in Figure 5C, in lungs, differing levels of expression of hypoxia-sensitive genes involved in the NO synthesis pathway are evident. Of note, the skin shows an initial spike in arginase-1 and -2 expression in the first 24 hr of exposure, which then declines. Skin NOS2 expression over the same time is marginally higher, however. In the lung there is no substantial increase in NOS2 or arginase-1 or -2 expression until after two days of exposure to hypoxia. The levels of NO metabolites seen in the skin and lung reflect the expression levels of arginase and NOS2 mRNA, with an increase seen in the skin at 24 hr and a subsequent decline to baseline levels after 2 days of hypoxia (Figure 5D). This is in contrast to the lung, which shows a gradual decline in NO metabolites at 48–72 hr (Figure 5E). These data indicate a temporal and tissue-specific shift in the expression of NOS2 and Arg-1/-2 in vivo. To test the hypothesis that keratinocyte HIF-1α/NOS/NO influences shifts in skin temperature, systemic blood pressure and heart rates during exposure to hypoxia, we next generated mice with NOS2 deletions in keratinocytes. Deletion efficiency of epidermal NOS2 in K14cre+ mice was calculated to be greater than 98% in all mice analysed (Figure 6B). The deletion of epidermal NOS2 shows changes in baseline skin temperature (which is likely correlated with peripheral vascular resistance) and systemic blood pressures similar to those seen in HIF-2α mutant mice, and initial changes in heart rate similar to those seen in HIF-1α mutant mice. 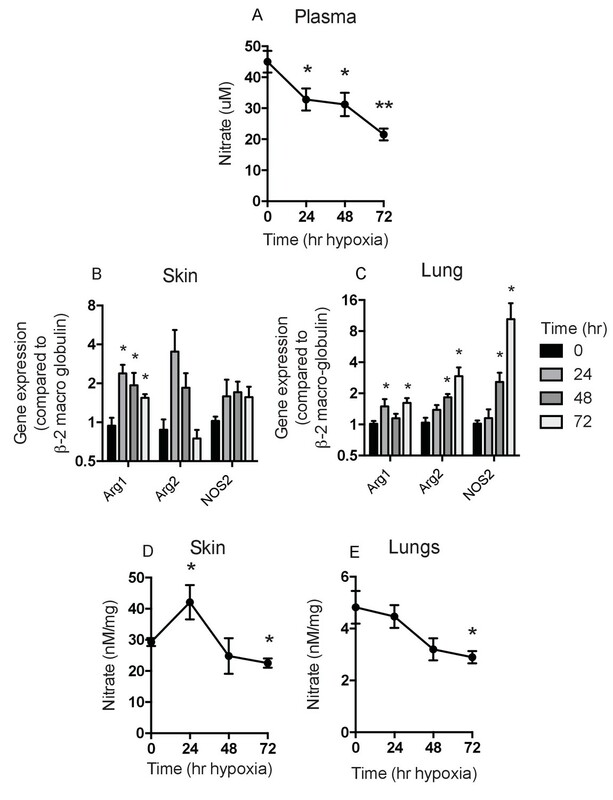 As shown in Figure 6A, epidermal deletion of NOS2 sustains an elevated skin temperature relative to littermate controls for the first 24 hr of hypoxia, before returning to levels seen in control mice for the remainder of the recording (for statistical analysis see Figure 9K). In Figure 6C and D, the similarities to the HIF-2α mutant mice are evident, as the K14-NOS2 mutant animals display a profound hypotensive phenotype, with an apparent decrease in both systolic and diastolic pressures within the first 20 min of hypoxia exposure (for statistical analysis see Figure 9L). This hypotensive state is maintained throughout the hypoxic time course (Figure 6D). Maximal deflection of systolic pressures (−15 to −20 mmHg) occurs between 24–48 hr hypoxic exposure when compared to littermate controls (statistical analysis Figure 9M). In contrast, NOS2 mutant heart rate acclimation to hypoxia responds in a similar pattern to the HIF-1α mutants, with a profound increase in BPM 120mins after hypoxia exposure. This is also maintained throughout the first 24 hr of hypoxia exposure (Figure 6E and F [for statistical analysis see Figure 9N and O]). The distinct tensive/cardiac response to hypoxia reported above may be due to a potential compensatory role of NOS1 and NOS3 expression in the skin counteracting the loss of NOS2. RT-qPCR analysis in whole skin samples identified a significant increase in the expression of both NOS1 and NOS3 in K14cre-NOS2 mice exposed to hypoxia (6 hr) when compared to littermate controls (Figure 6G). The compensatory roles of NOS isoform expression have been previously reported in other animal models of NOS deletion (Colton et al., 2006). Interestingly, comparative analysis of VEGF-A identified no compensatory expression in K14cre-NOS2 mice (Figure 6H). Physical activity is greatly reduced in littermate and mutant animals during the initial 12 hr of hypoxia and slowly recovers between 12–48 hr, although it does not fully recover until the animals are restored to normoxia (Figure 6I). To determine if the complex shifts in skin temperature, blood pressure and heart rate during hypoxia seen in HIF-2α mutant animals were due to HIF-2α regulation of the arginase pathway, we next analysed mice with Arg1 deletions in keratinocytes. As can be seen in Figure 7A, and similarly to what was seen in HIF-2α mutant mice, these animals display an elevated skin temperature relative to littermate control mice during the first twelve hours of hypoxic exposure, followed by a relative decline at 24 hr (for statistical analysis see Figure 9P). In Figure 7B (for statistical analysis see Figure 9Q) it is apparent that there is a small increase in systolic and diastolic pressures for the first 10 min hypoxia, followed by a decrease in both systolic and diastolic pressure. This occurs in a manner similar to that of littermate control animals. The recovery of a normotensive state in K14cre-Arg1 mutant mice, is somewhat similar to that seen in littermate controls (Figure 7C)(for statistical analysis see Figure 9R). However, the effect on heart rate is similar in some regards to that seen in HIF-2α mutants, with an overall increase relative to the hypoxia-induced decline seen in littermate control animals (Figure 7D)(for statistical analysis see Figure 9S), and a more rapid return to the normal pattern of diurnal variation in heart rate (Figure 7E)(for statistical analysis see Figure 9T). Metabolic activity of the Arg-1 animals also follows a similar trajectory to that seen in HIF-2α mutant animals. Both VO2 and VCO2 (Figure 7F–G) substantially increased between 12 and 48 hr of hypoxia, and this again coincided with heightened physical activity (Figure 7H). In each case, the changes seen in Arg-1 mutants were less striking than those seen in HIF-2α mutants, likely due in part to the presence of Arg-2 in the skin of these animals. These data indicate that a significant aspect of the HIF-2α-mediated changes in the cardiovascular response to hypoxia may be mediated via its regulation of arginase expression. We next questioned whether epidermal deletion of HIFα isoforms influenced the basal or hypoxia-induced ventilatory response. Whole-body plethysmography showed that resting ventilation rates are similar in the HIFα mutant animals relative to littermate controls (Figure 8A–B). All mice responded normally to acute hypoxia by increasing ventilation rates. 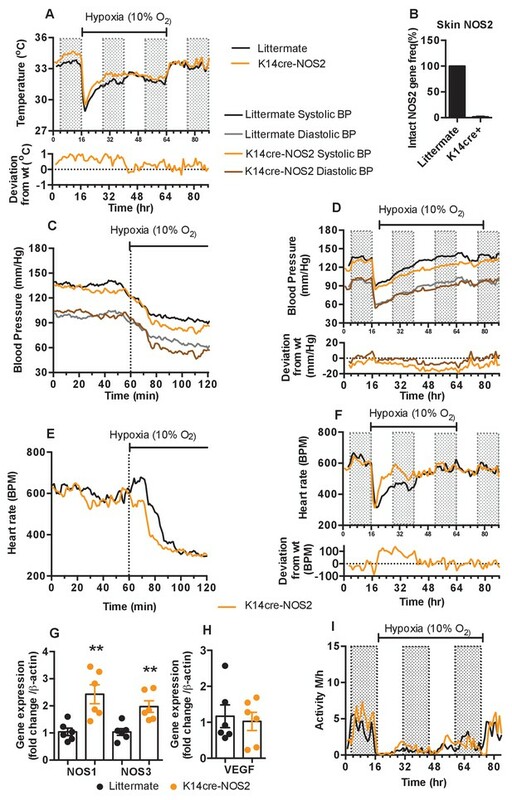 K14cre-HIF-1α, K14cre-HIF-2α, and wild type littermate control mice increased their respiratory rate for the initial 10 min of hypoxic exposure, before reducing their ventilation rates 30 min after exposure to hypoxia began (Figure 8A–B). Oxygen partial pressures in the blood were not significantly different from those seen in littermate animals during an acute hypoxic challenge (Figure 8C). Likewise, histological examination of the carotid bodies showed that there were no discernable differences in the size or number of oxygen sensing cells in the mutant animals when compared to those of littermate control mice (Figure 8D–F). Figure 8G shows representative photomicrographs of TH+ cells in the carotid bifurcation in littermates and K14cre-HIF-2α mice. Please see Figure 9A-T for graphic depictions of the statistical analyses characterizing these results. We believe that this is the first detailed investigation of cardiovascular acclimatization to hypoxia in mice over the time frames used here. Although there have been a number of previous studies examining cardiovascular hypoxic response, these have either ended after approximately ten minutes of observation and used anaesthesia, or have involved long term exposures, with monitoring after days or weeks of conditioning (Campen et al., 2004; Campen et al., 2005). Here, we monitored animals breathing 10, 12, 15, and 21% FiO2 for 48 hr, followed by a 24 hr recovery period. We found that mice exhibited a well-documented elevation of heart rate and blood pressure for the first ten minutes of exposure to hypoxia(Campen et al., 2004; Yu et al., 1999; Dematteis et al., 2008; Pearson et al., 2007), but then, experience a dramatic drop in both parameters. The maximal negative deflection in heart rate and blood pressure was observed at 3 hr post-onset of hypoxic exposure, which coincided with increased peripheral vascular resistance, and very low physical activity. Cardiovascular parameters were approximately restored to normoxic levels over the next 45 hr. These paths of decline and recovery are striking adaptive responses to hypoxia, and they appear to be graded relative to the degree of hypoxic challenge. The processes controlling cardiovascular responses to hypoxia are complex, and include chemoreceptors and baroreceptors as part of an autonomic nervous system reflex. These neurally-mediated responses also interact with, and may frequently mask, local tissue effects of hypoxia on cardiovascular responses, making it difficult to dissociate extrinsic and local tissue responses (Bärtsch and Gibbs, 2007). We have previously documented that a balance in keratinocyte HIF-1α and HIF-2α expression modulates peripheral vascular resistance (Boutin et al., 2008), and that this directly affects murine systemic blood pressure; it is also correlated with the tonic tensive state in mildly hypertensive humans (Cowburn et al., 2013). 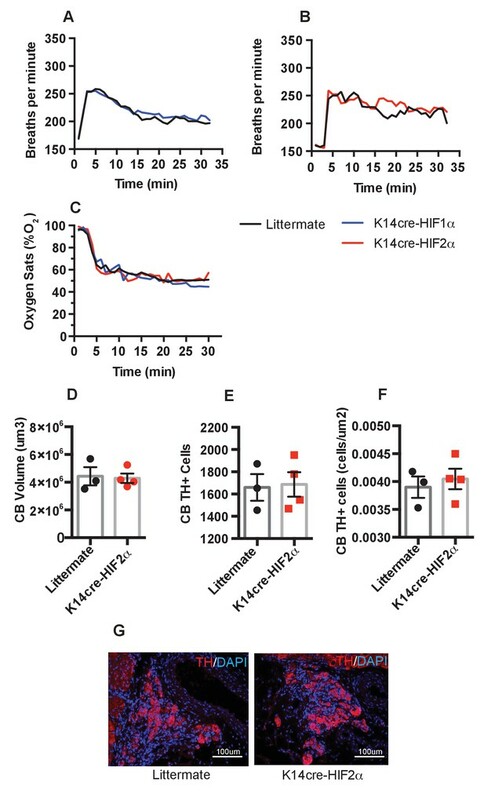 Here we show for the first time that keratinocyte HIF-1α and HIF-2α expression affects the immediate, acute and chronic phases of the cardiovascular response to hypoxia. Hypoxia immediately heightens sympathetic tone in the skin to increase peripheral vascular resistance (Simmons et al., 2007; Chalmers and Korner, 1966; Kollai, 1983). 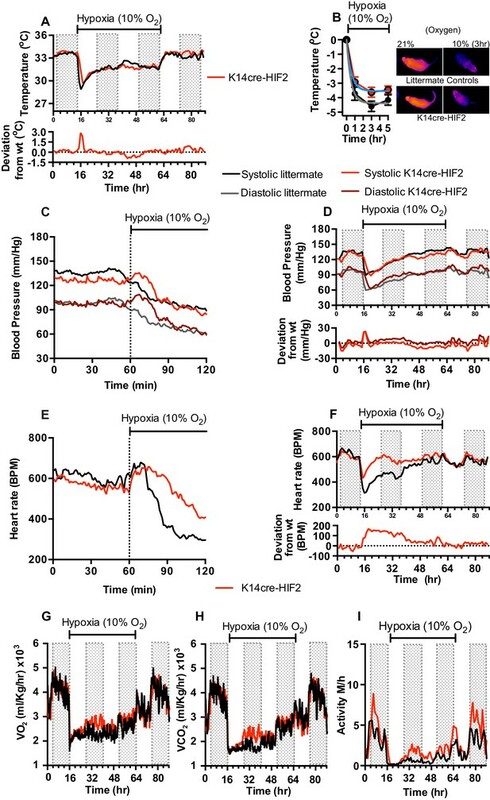 Hypoxia also increases nitric oxide release from keratinocytes to stimulate vasodilation and act as a neuromodulator of sympathetic activity, dampening vasoconstriction (Ramchandra et al., 2005; Sartori et al., 2005; Hirooka et al., 2011). The opposing roles of keratinocyte HIF-1α and HIF-2α on nitric oxide synthesis (Cowburn et al., 2013) would suggest divergent effects on sympathetic activity and blood flow in this highly vascular tissue. Epidermal HIF-1α is shown here to have a direct effect on peripheral vascular resistance and the tonic tensive status of the mouse. The opposite cardiovascular relationship is apparent in the HIF-2α mutant mouse. In the case of the HIF-2α mouse, however, there is a significant increase in heart rate, likely to maintain systolic blood pressure. In this mutant, there appears to be a transition/acclimation checkpoint following 24 hr in hypoxia. The heart rates of both HIF-2α mutant and littermate mice converge at this point, and systolic pressure of the HIF-2α mutant drops below that of controls. This suggests a sustained decrease in the vascular resistance of the skin. Epidermal deletion of arginase-1 in this hypoxia acclimation model phenocopied several characteristics of the K14cre-HIF-2α mutant mouse. There is an overall lessening of the effect, however, indicating that other genes controlled by HIF-2α are likely involved in the hypoxic acclimation process. These alterations in peripheral vascular blood flow also appear to affect whole body metabolism and physical activity during the acclimation phase to hypoxia. Although all four epidermal mutant mice described here demonstrated a similar increase in oxygen consumption during this acclimation phase, only K14cre-HIF-2α and K14cre-arginase-1 mice demonstrated some preservation of physical activity in comparison to wild-type animals. This is intriguing, as it indicates that the response of the peripheral tissue can modulate the animals overall behaviour during environmental stress. Interestingly, the data presented here are consistent with cardiopulmonary investigation of patients with germline, heterozygous gain-of-function mutations in HIF-2α, where baseline heart rate and cardiac responses to moderate hypoxia were shown to be higher in the HIF-2α-gain of function patients when compared to control subjects, suggesting an increase in cardiac sympathetic tone (Formenti et al., 2011). In summary, we present here the first dissection of the murine cardiovascular response to hypoxia, and we present evidence that this response is highly influenced by peripheral vascular responses. This indicates that peripheral tissues, and their vascular beds, form a complex physiological network of oxygen-responsive tissues that influence, and are not just influenced by, central regulators of cardiovascular function. This interaction amongst tissues indicates that cardiovascular responses to hypoxia are likely a summation of a range of tissue responses, and not solely dictated by central mediators of cardiovascular activity. All animals were housed in an association and accreditation of laboratory animal care international-approved facility. All protocols and surgical procedures were approved by the UK Home Office and the University of Cambridge Animal Welfare Ethical Review Board (AWERB) under project license 80/2565 from the UK Home Office. Targeted deletion of Hif1a (HIF-1α), Epas1 (HIF-2α), Nos2 (NOS2)and Arg1 (arginase-1) in keratinocytes was accomplished by crossing mice (in a C57/Bl6J background ascertained by extensive backcrossing and SNP analysis) homozygous for the floxed allele in HIF-1α, HIF-2α, NOS2 or Arginase-1 into a background of Cre recombinase expression driven by the K14 promoter, which is specific to cells of the keratinocyte linage. The NOS2 mouse was generated by Ozgene (Perth, Aus) in C57Bl6 embryonic stem cells via homologous recombination, and uses a placement of the loxP sites flanking exons 3. Cre recombinase-mediated deletion of the loxP-flanked exon introduces a translational frameshift, rendering downstream exons non-functional. All radio-telemetry hardware and software was purchase from Data Science International. (St Paul, MN, USA). All procedures regarding preparation of the transmitter are carried out in aseptic conditions. The regulated procedure describing the aseptic implantation of the radio-telemetry device has previously been described (Cesarovic et al., 2011). Data acquisition only commenced following the complete recovery of the animal from the regulated surgical procedure (at least 10 days). All baseline telemetry data was collected over a 96 hr period in a designated quiet room to ensure accurate and repeatable results. Radio-telemetry/hypoxia challenge was conducted in combination with Oxymax Lab animal monitoring system (CLAMS)(Columbus Instruments, Columbus, OH, USA). Mice were placed in environmental chambers and allowed to acclimate for 24 hr before the oxygen content of the flow gas was reduced to 10%. The mice were continuously monitored for the next 48 hr before being returned to normal atmospheric oxygen for a further 24 hr. Carotid body histology was performed as previously reported (Macías et al., 2014). Briefly, carotid bifurcations were dissected, fixed for 2 hr with 4% paraformaldehyde (Santa Cruz) and cryopreserved with 30% sucrose in PBS. 10 μm-thick cryosections were obtained (Bright cryostat) and tyrosine hydroxylase (TH) positive cells were detected by immunofluorescence using rabbit anti-TH antibody (Novus bioscience ref: 300–109) and goat anti-rabbit Alexa568 antibody (Life technologies ref: A11036). Carotid body volume and cell numbers were quantified on microscope images (Leica DM-RB) using ImageJ software. A single chamber plethysmograph (Data Science) was used in conjunction with a pressure transducer. This utilises the barometric analysis technique that compares the pressure difference between the animal chamber and a reference chamber to measure airway physiological parameters. Unanesthetized mice were randomly placed into the plethysmograph and allowed to acclimate. Baseline averages of breathing frequency, tidal volume, inspiration and expiration volumes/times were recorded. Once acclimated to the chamber, the composition of the flow gas was switched from 21% O2 to 10% O2 using a PEGAS mixer (Columbus instruments). The mice were housed in the reduced oxygen environment for 60 min before being returned to atmospheric oxygen. Blood samples were centrifuged to separate plasma and were passed through a column with a 10 kDa cut-off filter. All samples were analysed for total NO(X) content using a NOA 280i (Siever, GE Healthcare) according to the manufacturers instructions. The preparation of primary keratinocytes from adult mouse tail skin is comprehensively described by Lichti et al. (2008). Total RNA was isolated from skin using TRI-reagent (Sigma), followed by RNA clean-up and DNase digest using RNeasy column kits (Qiagen, Manchester, UK). First-strand synthesis was performed with 1 μg of total RNA using a high-capacity cDNA kit (Applied Biosystems, Paisley, UK) according to the manufacturer’s instructions. Relative gene expression was determined by qPCR (ABI system, Applied Biosystems) and amplified in Sybr-green master mix (Roche) using relevant primers from Qiagen. Deletion efficiency was characterised for NOS2 in the K14cre+ mouse using DNA isolated from skin samples using TRIzol/DNeasy columns (Qiagen, Manchester. UK). The PCR primers and Taqman probe were designed in-house and synthesised by Sigma (Gillingham UK) fwd 5’-TCCAGAATCCCTGGACAAG rev 5’-TGGTGAAGAGTGTCATGCAA, probe 5’-FAM-TGTGACATCGACCCGTCCACA. Energy expenditure of the K14cre mice and their littermate controls was measured using the Columbus Instruments Oxymax system according to the manufacturers instructions (Cowburn et al., 2013). Baseline radiotelemetry parameters in Figure 1 were analysed by determining the area under curved for each mouse per group and then performing a mann-Whitney test to determine the statistical difference across groups compared to littermate. Mann-Whitney test was used to analyse RT-qPCR gene expression and plasma/tissue nitrate data in Figure 5. Non-linear regression modelling, using a least squares method, was used to model the radio-telemetry data in Figures 3, 4, 6 and 7 Akaike’s informative Criteria (AICc) was used to compare models, and determine whether the data were best represented by a single model, or by separate ones. Analysis was undertaken using GraphPad Prism Version 7.0 c for Mac OS. The Journal of Physiology 191:309–324. The Journal of Physiology 551:379–386. Journal of Applied Physiology 99:2028–2035. Journal of Visualized Experiments, 10.3791/3260, 22126906. The Journal of Physiology 184:685–697. Journal of Investigative Dermatology 134:801–808. American Journal of Respiratory and Critical Care Medicine 177:227–235. Cell Adhesion & Migration 4:391–395. The Journal of Physiology 461:431–449. AJP: Regulatory, Integrative and Comparative Physiology 300:R818–R826. Journal of the Autonomic Nervous System 9:497–512. Quarterly Journal of Experimental Physiology and Cognate Medical Sciences 45:113–122. Journal of Applied Physiology 74:211–214. Advances in Experimental Medicine and Biology 543:249–262. Progress in Cardiovascular Diseases 52:456–466. Pflügers Archiv - European Journal of Physiology 454:29–39. Journal of Investigative Dermatology 128:1964–1968. Clinical and Experimental Pharmacology and Physiology 32:440–446. Intensive and Critical Care Nursing 25:31–37. Journal of Human Hypertension 28:705–710. Annals of the New York Academy of Sciences 1177:2–8. Journal of Applied Physiology 103:608–615. Journal of Applied Physiology 22:1124–1128. The Journal of Physiology 575:263–275. American Journal of Physiology. Heart and Circulatory Physiology 279:H2344–2349. The Journal of Clinical Investigation 103:691–696. Thank you for submitting your article "Cardiovascular adaptation to hypoxia: the role of peripheral resistance" for consideration by eLife. Your article has been favorably evaluated by Didier Stainier (Senior Editor) and three reviewers, one of whom, Jan-Marino Ramirez (Reviewer #1), is a member of our Board of Reviewing Editors. This is an important and novel study by Cowburn et al. that significantly contributes to our understanding of long-term adaptation to hypoxia. The authors provide evidence that keratocytes play an important role in the midrange adaptation to chronic hypoxia. They specifically demonstrate that the cutaneous HIF1-HIF2-axis plays a key role in cardiovascular responses upon exposure of mice to low oxygen environments. The authors argue that HIF1α promotes via NOS2-dependent NO production local cutaneous vasodilatation. In contrast, HIF2α antagonizes this response by promoting local skin Arginase expression and thereby diminishes Arginine, which is a critical substrate for NOS2. The main concern raised by the reviewers centered on the statistical analysis and some of your conclusions. As you will see, we provide specific recommendations to address this concern. 1) The study reports several observations with a low "n", and in these cases the numbers should be increased. As an example, in the last paragraph of the subsection “Loss of HIFα isoforms in the epidermis differentially affects blood pressure and skin temperature across diurnal cycles” the authors state that there was a tendency towards a temperature effect in HIF2α mutants. This statement is based on an "n" of only 4. Clearly this finding is "underpowered" and more n's are needed to come to a meaningful conclusion. 2) The Figure 8 summarizes the "statistical analysis". Several of the findings really don't look significantly different. E.g. I don't see how differences in the heart rate changes as shown in Figure 8D or 8N should be highly significant. The same applies to Figure 8F; the differences seem quite subtle. This is consistent with our general concern (see next comments), that the statistical analysis was not always appropriate. 3) The authors stated that two-way ANOVO with Dunnett's test was used to compare K14cre-mutants to wild-type controls under baseline condition in Figure 1. While two-way ANOVA is a good option for testing statistical difference when combining strains with treatments (baseline, hypoxia, recovery). However, given the fluctuation of data I believe there is a significant interaction between two independent variables. Thus, we urge the authors to consider additional tests. 4) The use of un-paired t-test for analyzing gene expression is not appropriate since the values tested have been normalized, and the normalization could violate one or more of the underlying assumptions for the test. A non-parametric test should be used instead. 5) The Akaike information criterion (AIC) measures the relative quality of models but does not test a null hypothesis. Thus, the p values in Figure 8 are misleading and should be removed from this figure. 6) The authors did not mention what statistics methods were used for testing differences in cardiovascular radio-telemetry parameters among strains during hypoxia and recovery. This information should be provided. 7) As already mentioned above, in several instances the sample size of each group is too small (i.e., n=2-6) and makes the results questionable. Variation in each group should be reported in a certain form (e.g., text, table or figure), and additional n's should be provided. 8) Please clarify the following issue: Peripheral resistance has been considered a major contributor to diastolic pressure. 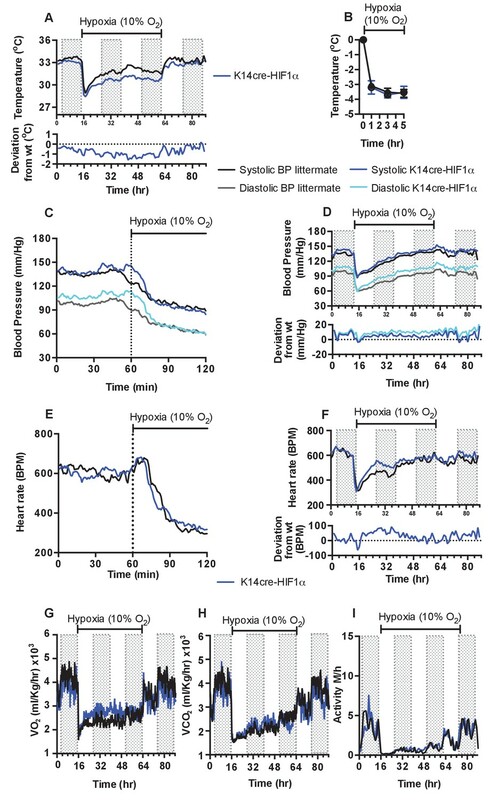 If HIF-2α is important in regulating peripheral resistance as proposed by the authors, how do you interpret that effect of keratinocyte deletion of HIF-2α is more profound in systolic than diastolic pressure, as shown in Figure 4C (0-16 hr, 48-64 hr)? Indeed, diastolic pressure during 0-16 hr and 48-64 hr (Figure 4) seems not to be different in HIF-2α KO from WT. 9) NO production by NOS requires molecular O2. How do you interpret the increased NO production in the skin during prolonged hypoxia (Figure 5)? Please also explain why the biochemical measurements were obtained from tissues of mice treated with 72 hrs hypoxic exposure, whereas physiological measurements were made in mice treated with 48 hrs hypoxia? 10) The authors argue that HIF1α affects peripheral resistance. This statement is based on quantification of skin body temperature as surrogate parameter (subsection “Cardiovascular responses to 48 hours of hypoxia: brief initial hypertension and tachycardia, followed by hypotension and bradycardia”, third paragraph). Alternatively, HIF1-HIF2 might impact on skin temperature by affecting mitochondrial energy production (e.g. Thomas et al., 2017, AJPRP). The authors might want to consider backing up these findings with experiments that directly demonstrate effects of HIF1-HIF2 axis on skin tissue perfusion. 11) As far as we understand the authors used WT mice as controls for their conditional skin specific k.o. mice. I wonder whether the authors performed controls that demonstrate that littermates of their conditional Hif1, Hif2a and Arg1 mice show similar responses as did the WT BL/6 mice? 12) The impaired suppression of heart rate upon hypoxic exposure in K14-HIF2 k.o. is impressive (Figure 4D). The authors argue that K14-Arg1 k.o. display similar findings (Figure 6D). However, the figures are rather different. Therefore, we don't agree with the authors' statement that "the effect on heart rate is similar". These data rather suggest that K14-HIF2 differentially affect heart rate, which is not linked to Arg1 expression. In K14-HIF2 HIF1 might compensate for losses of HIF2. Along this line, there is some evidence that in addition to HIF2 (as shown by the authors in previous studies) HIF1 might regulate Arg1 as well (Colegio et al., Nature, 2014). Overall, we are not sure whether all the effects observed in K14-HIF2 mice are due to diminished Arg1 expression. Please clarify. 13) The authors demonstrated earlier that skin HIF-1 is required for renal EPO production (Cell 2008). Therefore, it remains unclear whether the cardiovascular responses observed in the K14-Hif1 situation are due to local regulation of tissue perfusion (as suggested in this paper) or affected by alterations in blood viscosity and blood oxygenation (due to suppressed EPO production). Experiments that dissect the contribution of EPO vs. local effects of HIF1 would help to clarify this issue (e.g. injection of rm-EPO in K14-Hif1 mice). 14) Please better emphasize the novelty (specifically the mechanistic insights) of the present study, compared to the cardiovascular characteristics of the mutant mice reported previously by the same group (PNAS, 2013; (Cowburn et al., 2013). 15) Cardiovascular control is a highly integrative process and peripheral resistance is one of major determinates of blood pressure. How do you integrate your finding to the overall control of blood pressure? 16) The authors need to explain whether the delayed cardiovascular responses in K14Cre-HIF-1α mice are due to higher baseline blood pressure. Likewise, changes in heart rate responses in K14Cre-HIF-2α mice might as well be due to baseline bradycardia. We appreciate the concern regarding the sample number in this study, and have spent the last two months adding to the animal number studied to alleviate this concern. We have now increased the experimental n by implanting radio-telemetry probes and carrying out studies in an additional 16 mice in the existing groups, as well as adding a new experimental group of animals with keratinocyte-specific deletions in the NOS2 gene. This has increased baseline recording to between 7-10 mice for K14cre-HIF1α, K14cre-HIF2α and all littermate controls. Additional mice were also exposed to the chronic hypoxia protocol, and that data has now been incorporated into our analyses. New data has been incorporated into Figures 1, 2, 3, 4, 5, 7 and 9. Statistical analyses were completed and have now been included in a new Figure 9. We have now undertaken a new series of analyses, which are depicted in Figure 9. We now use the Akaike Information Criterion (AIC) to determine the relative quality of the models. This analysis is not hypothesis driven, and so does not produce a p value. We appreciate the reviewer comments regarding the statistical analyses of Figure 1. We have now increased the n value for this figure and analysed the curves by determining area under curve of each mouse per group and used a non-parametric Mann-Whitney analysis to compare mutant animal groups to littermate controls. We have now increased the n value of all components. This has allowed the use of a non-parametric Mann-Whitney test to determine significance. We agree. The p values have now been removed. The sample size of animal groups has now been increased. We have implanted an additional 16 radio-telemetry probes for the acute/chronic cardiovascular acclimation to hypoxia, and increased each component of Figure 5 (nitrate analysis and gene expression) with an additional 5 mice. We understand the reviewers concerns with regards to the visualisation of the telemetry data set, shown as mean values. Our original aim was to provide the reader with a clean line graph for clear interpretation. We now provide an excel spreadsheet containing mean and standard error of mean across the time course for all telemetry figures so as to provide all information necessary for readers to interpret our findings. The reviewer makes an important point here. We hope it is apparent that in this manuscript we are just beginning an analysis of the complexity of tissue-specific feedback on regulation of cardiovascular response. The most straightforward way for this to occur is via localized changes in peripheral resistance; but clearly, there are other potential means for peripheral tissues to alter cardiovascular response, and the HIF system regulates many different genes that can accomplish this. As changes in peripheral resistance do occur in these models, along with changes in diastolic pressure, we have focused much of our discussion on those changes, but have touched on the other multiple factors that will need to be considered in interpreting and ultimately expanding on these findings. The explanation for how NO generation can increase when oxygen levels drop is simply that this is due to increases in NO synthase levels, coupled to increases in L-arginine availability; these are able to compensate for lowered oxygen availability. It should be noted that there are still very significant levels of oxygen available in tissues and cells at environmental oxygen levels of 10%. We have now increased the n values for Figure 5 and included data for 48hrs hypoxia. We appreciate the reviewers concerns, and have performed two additional sets of experiments in response. First, we have analysed skin surface temperature using a Flir infra-red thermal imaging camera. These measurements were taken from littermate controls and K14cre-HIF1α and K14cre-HIF2α mice in normoxia, followed by repeat measures at 1-3-5hrs under hypoxia (10% O2) We have performed a non-linear regression analysis and asked whether a single line would fit both data sets or whether a separate line would be required for each data set. However this method focuses on surface skin temperature. We would also like to make available laser Doppler data for the reviewers only. We have spent a considerable amount of time fine tuning anaesthetic delivery and thermoregulatory parameters in order to determine peripheral vascular response to hypoxia. Our protocol consists of anaesthetising a mouse with isoflurane 2% at 2L/min oxygen, after which this is quickly reduced to 1% isoflurance on a nose cone. The mouse is kept thermoneutral on a lightly heated blanket and temperature monitored. The laser Doppler starts recording hind-limb blood flow within 3 minutes of anaesthetic induction. The Doppler takes very high definition images over a 1 minute recording time. Initially, 3 images were recorded, before the composition of the anaesthetic carrier gas was altered to 10% O2 (Author Response Image 1). Images were recorded for an additional 32 minutes. Peripheral perfusion was analysed frame by frame using Moors Instruments analysis software. A) Skin blood flow (flux) as a percentage of baseline (image 1). Black squares represent skin perfusion of mice maintained on normal anaesthetic carrier gas for the duration of the protocol. The main concern we have with this data, and the reason we do not wish to include it in the manuscript, is an increase in baseline skin perfusion with time using an inhaled anaesthetic agent. We would like to make the reviewers aware of a number of papers highlighting the caveats of using inhaled isoflurane in conjunction with measuring cardiovascular parameters in small rodent models (C Constantinides. ILAR J, 2012; CF Yang. TC Med J 2014). However, switching the anaesthetic carrier gas to 10% oxygen (A, black circles) re-capitulated the documented peripheral vascular flush induced by hypoxia, however this was not followed by hypoxia driven peripheral vasoconstriction at later time points that we see. We feel the anaesthetic agent is masking this latter physiological response. We also analysed K14cre- HIF2α mice with this protocol. The initial hypoxic vasodilation reflex was preserved in these mutant animals. Interestingly the degree of vasodilation was maintained throughout the remaining hypoxia protocol, indicating a significant effect of the mutant on peripheral vascular flow. We feel these data are key to the review process of this manuscript, but are compromised by the secondary effects of the inhaled anaesthetic agent, and therefore wish to include these data solely for the purposes of response to the reviewers concerns. All procedures performed with K14cre+ animals throughout this manuscript have been accompanied by littermate control animals. The nomenclature has been clarified where appropriate. Only data for Figure 5 used wild-type C57Bl6 mice. We agree that the overall response to loss of epidermal HIF-2a is broader, stronger and certainly more complex than that seen when the same tissue lacks Arg1. And we agree that this is related at least in part to the reasons cited by the reviewers. We now have revised our descriptions of these results to better reflect these considerations. We appreciate the reviewers’ concerns with regard to the potential role of EPO, haematocrit and blood viscosity in the cardiovascular response observed in the K14cre-HIFα mice. The Cell manuscript referred to discusses over-expression of HIF, occurring in a K14cre-VHL deletion model; in that mutant, there is an excess of EPO and a high hematocrit. That manuscript goes on to show that basal EPO levels are unchanged in K14cre-HIFa mutant animals, and that their haematocrits are also normal. We have measured basal haematocrits in k14cre+ mutants and littermates used here and seen no significant differences. We would also like to draw the reviewers’ attention to our recent manuscript: Cowburn, et al., PNAS 2106, where in supplemental Figure 2E we show a time course of hematocrit changes during hypoxia (10% O2). Although there is a small increase in hematocrit following 7 days of exposure to hypoxia, this only becomes significant following 14 days of exposure. This is consistent with the findings of many other researchers on both normobaric and hypobaric hypoxia. We thank the reviewer for this suggestion, and in this revision have attempted to better address the novelty of this study. As regards the previous study, the key difference here is that initial study looked at static blood pressures, and did not employ telemetry, but rather described single observations of blood pressure. Additionally, and more importantly, that study did not look at response to any stressor, but looked instead at steady state blood pressures. It is the difference in a dynamic response to hypoxia that is the key novel aspect of this study, and this was not addressed at all in our previous work. We agree that this is, in the end, the most important consideration: how does this finding integrate with a classical understanding of blood pressure regulation and response to stress. We feel that this will require, first, more work; and then a review article or a series of them to begin to integrate understanding of peripheral responses and their influence on the cardiovascular stress response. We hope that this article ultimately is part of the beginning of this reconsideration of how blood pressure regulation and response functions. We see variations in response over time here; that is, indeed, our key finding. 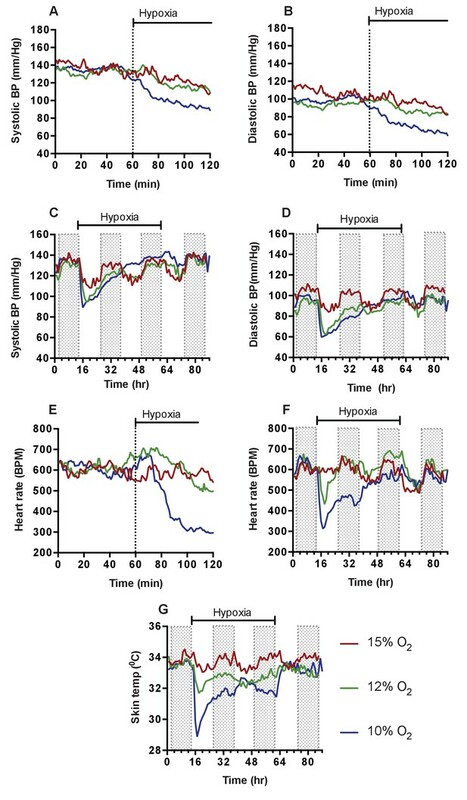 It is these variations that demonstrate that we are not simply seeing the effects of a mild constitutive hyper- or hypotensive state on hypoxic response. These dynamic changes have considerable complexity, and will need further work to be mechanistically defined. However, we feel that they confirm our hypothesis, i.e., that there is a significant role for peripheral tissue response via HIF in the dynamic response of the cardiovascular system to changes in oxygen availability. Animal experimentation: All animals were housed and all experiments carried out according to approved protocols and under the guidance and approval of the UK Home Office, under the auspices of an approved Program Project License, and with ethical approval of the University of Cambridge Animal Welfare Ethical Review Board under project license number 80/2565. © 2017, Cowburn et al.